The Nestle Compleat Modified Tube Feeding Unflavored Food 1000ml 6-Pack, Model #14180100, is anchored in advanced science and research. Nestle Healthcare Nutrition offers nutritional solutions for people with specific dietary needs related to illness, disease states or the special challenges of different life stages. 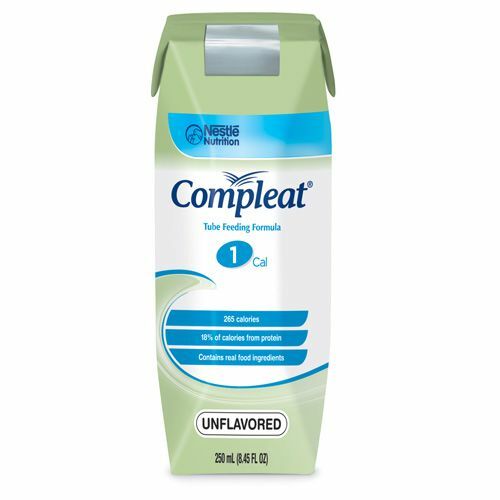 The Nestle Compleat Modified Tube Feeding Unflavored Food 1000 ml Pack of 6 is developed for patients who desier a real food component. This formula is a blenderized tube feeding formula with real food ingredients, including chicken and vegetables, plus soluble fiber to help support digestive health and normal bowel function. Compleat is a safer and more convenient alternative to blenderized, homemade tube feedings.